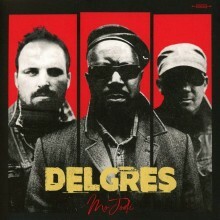 Delgres, the Paris-based blues trio, links the history of the French Caribbean to the musical style of New Orleans in their debut album, Mo Jodi. Meaning “Die Today” in Creole, the album’s name is inspired by the sacrifice of Louis Delgrés, the band’s namesake, who died fighting against the reinstatement of slavery in Guadeloupe. Founder and leader of Delgres, Pascal Danaë, traces his roots back to Guadeloupe where his great-great-grandmother was a slave. Mo Jodi was born of the group’s love of jazz and blues and Danaë’s connection to both his ancestral homeland and New Orleans, where many Guadeloupians sought refuge during the early 1800s. Delgres’ influences may be rooted in history, but their music speaks out on contemporary forms of oppression and human rights violations. The opening track, “Respecté Nou” (Respect Us), is inspired by the strength that Danaë’s enslaved ancestors showed in the face of hatred. A song with more modern inspiration is the pointed “Mr. President,” in which Danaë sings, in Creole, “But I did vote for you, put my trust in your hands, now could you please explain what you’re gonna do for me ‘cause I’m still struggling.” Sung in both Creole and English, the 12 tracks on Mo Jodi offer a strong commentary on current social and political affairs while paying tribute to Delgres’ French-Caribbean background. Despite the emotionally-charged and powerful nature of the tracks on Mo Jodi, Delgres is always sure to deliver a light-hearted, exciting live performance. Their North American tour is currently in session and will wrap up later this month. For upcoming performances, see their website. This entry was posted in Blues and tagged Blues, CD review, Chloe McCormick, Delgres, Mo Jodi, PIAS Records by aaamc. Bookmark the permalink.